Sometimes my mind wanders off from Asia and starts thinking about the next trip. 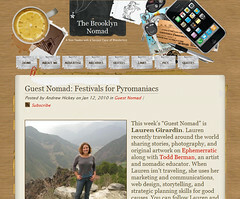 In those moments, I’m happy to be able to find a guest blogging gig on other travel sites like The Brooklyn Nomad. In “Festivals for Pyromaniacs” I write about global effigy burning celebrations like Zurich’s snowman-torching Sechseläuten; Antigua, Guatemala’s devil-barbecuing La Quema del Diablo; and Cheung Chau’s (near Hong Kong) ghost king-roasting Bun Festival. Please hop on over to The Brooklyn Nomad and share your comments about massive displays of things on fire. In other good news, my photo from a Madrid bullfight is the lead image on The Observers‘ article, “Catalonia bullfighting ban: breeder fights back.” The article author, Alejandro Melgarejo, is a bull breeder and would value your comments on the issue of bullfight bans. While you’re at it, read my story about attending a bullfight in Madrid.